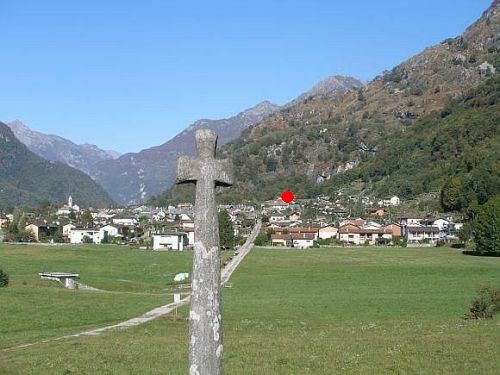 WELCOME TO THE PICTURESQUE MAGGIA OF VILLAGE! 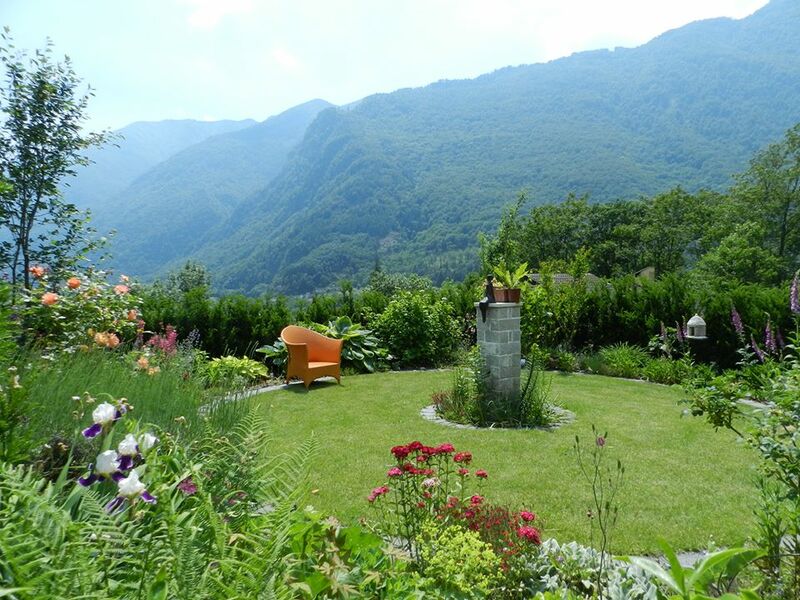 Casa alla Cascata takes its inspiration from the bond that exists between man and nature: through natural materials (stone, wood and wrought iron) it aims to evoke harmony with the earth. 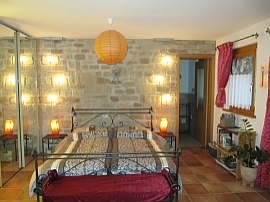 The holiday apartment is elegantly furnished to a very high standard and offers a warm, relaxing and romantic atmosphere complemented by stunning views. 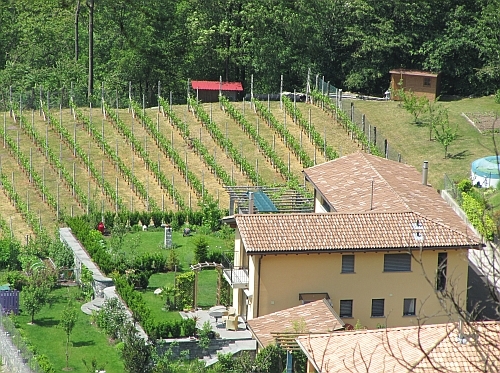 GARDEN OF THE SENSES (herbs, fruit and ornamental plants) divided into 7 separate "rooms"
Casa alla Cascata is oriented so that when you wake up you are greeted by the morning sun, and when the day is over you can relax and watch the sun go down. The large south-facing garden is arranged on two levels and is divided into seven separate "rooms". 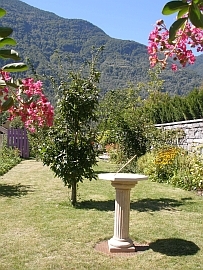 The well-tended English-/Mediterranean-style garden features a wealth of flowers, fruit trees, berry bushes and medicinal plants, and the kitchen garden contains aromatic herbs (including a mint and sage collection) and root and leafy vegetables (a total of around 45 edible plants including 29 types of berry bushes and fruit trees*). * Apple, plum, damson, pear, wild pear (serviceberry); Mini-kiwi, wild strawberry, large strawberry, Japanese wine berry, aronia berry, blueberry, cranberry, raspberry, yellow raspberry, tayberry, loganberry, blackberry, gooseberry, josta gooseberry, black currant, red currant, white currant, pink currant, schisandra berry and 5 types of grape. "We received a very warm welcome and felt at home from the very moment we arrived. In the spotless, cosy apartment we were greeted with a small, lovingly arranged bouquet of flowers on the table, chocolates on our pillows, a home-made fruit cake in the fridge and a bottle of wine... it was immediately apparent to us that our hosts really cared about their guests. 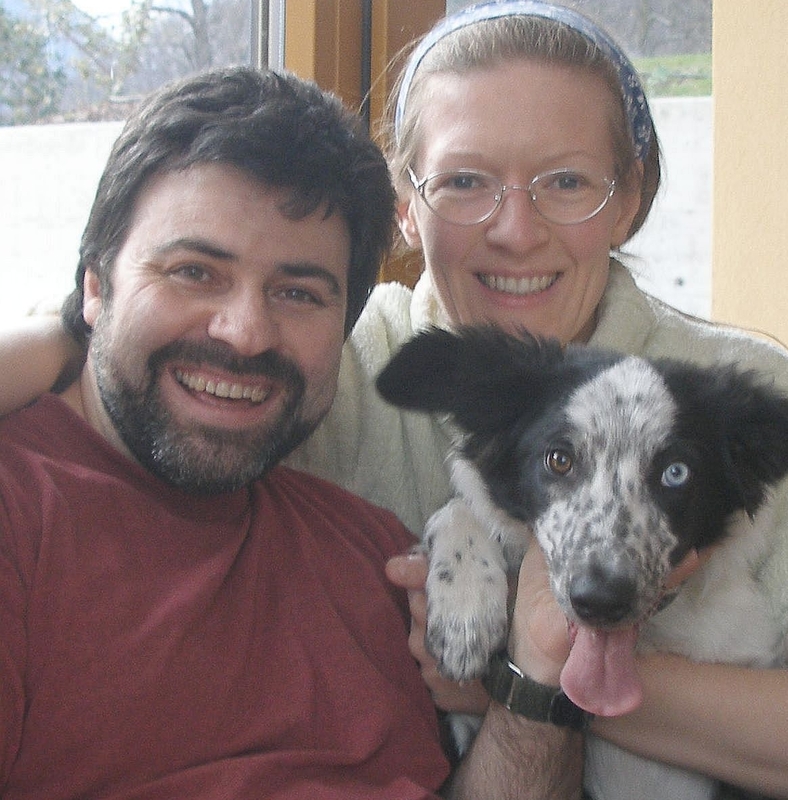 And so we experienced the warm hospitality of Tanya and Angelo and their lovely [Border collie] Shep (who got on very well indeed with our own dog). We thoroughly enjoyed our time at Casa alla Cascata. It was hard for us to leave at the end of our holidays. 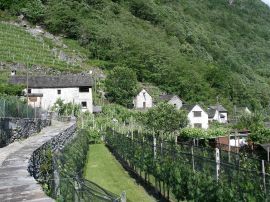 We will definitely return to Casa alla Cascata! Thank you so much for two beautiful weeks!" 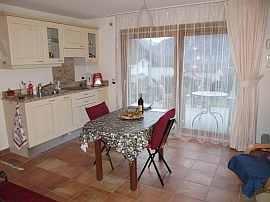 "The nicest holiday apartment we have ever stayed at in the Maggia Valley!" 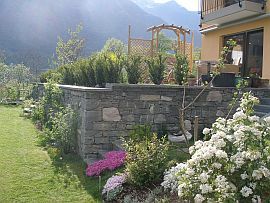 "The apartment is lovingly furnished with attention to detail: we liked it very much; the garden, the herb garden. Tanya and Angelo are very friendly, attentive hosts and gave us tips and information. The best apartment we have stayed at ever. "Well furnished, very clean and, above, very quiet." 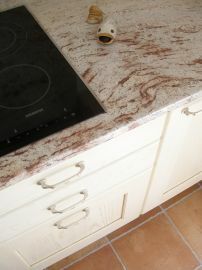 "Very functional and moderm; very clean. 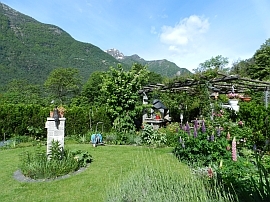 We were impressed by you both (and by Shep) with your quite unique combination of English garden design and southern Italian temperament. 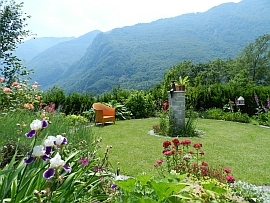 We shall definitely be visiting the Ticino more often..."
Casa alla Cascata (house by the waterfall) is set in the picturesque village of Maggia, centrally located in the Maggia Valley, a region of outstanding natural beauty. 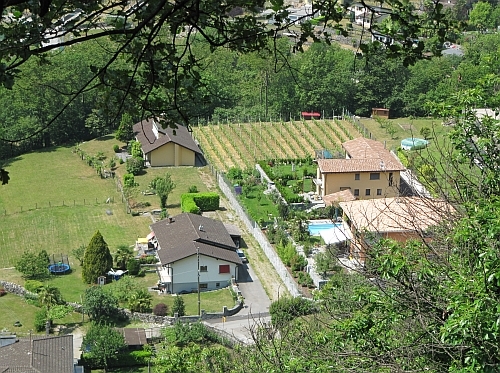 Situated in a quiet cul-de-sac in the highest, sunniest part of the village (a short walk from the centre) and surrounded by green, the house enjoys a very peaceful atmosphere with magnificent views of the valley and mountains lined with terraced vineyards. 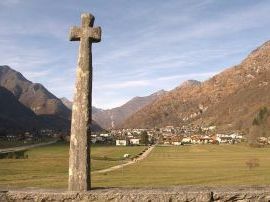 to the south: sweeping view of the Maggia valley including Lodano, Moghegno and Aurigeno. 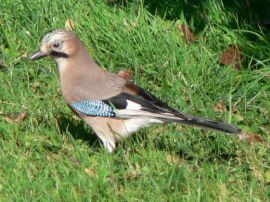 In the morning you are greeted by a chorus of birds chirping happily in the vineyards, trees and bushes; throughout the day, you can enjoy the croaking of frogs and the whirr of grasshoppers in the warm summer air to the rhythm of the cuckoo; in the evening you may catch a glimpse of various wildlife as they venture down from the mountains and out of the woods after dusk. All this to the soothing sound of the Maggia Waterfall. 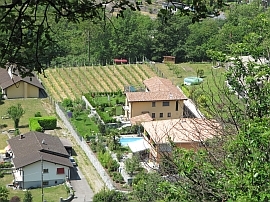 Just two minutes' walk through the woods behind the house is the awe-inspiring Maggia Waterfall, a delightful place for swimming and sun-bathing on the large, smooth sun-warmed boulders. 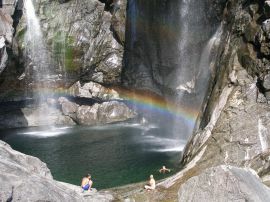 The crystal-clear water from the waterfall flows into the Maggia River below, along which there are several other bathing locations. 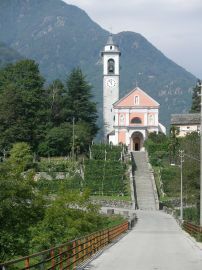 Maggia is just 15 minutes' drive from Locarno. 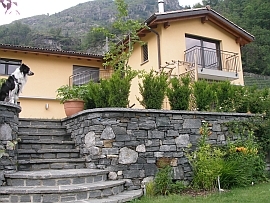 self-catering Lake Maggiore; self-catering Lago Maggiore; self-catering accommodation on Lake Maggiore; self-catering accommodation on Lago Maggiore, self-catering accommodation Lake Maggiore accommodation Lago Maggiore accommodation Hotel Lake Maggiore Hotels Lake Maggiore Hotel Lago Maggiore Hotels Lago Maggiore; holiday apartment Lago Maggiore holiday apartments Lago Maggiore; holiday apartment Lake Maggiore holiday apartments Lake Maggiore; holiday flat Lago Maggiore holiday flats Lago Maggiore; holiday flat Lake Maggiore holiday flats Lake Maggiore; self-catering. 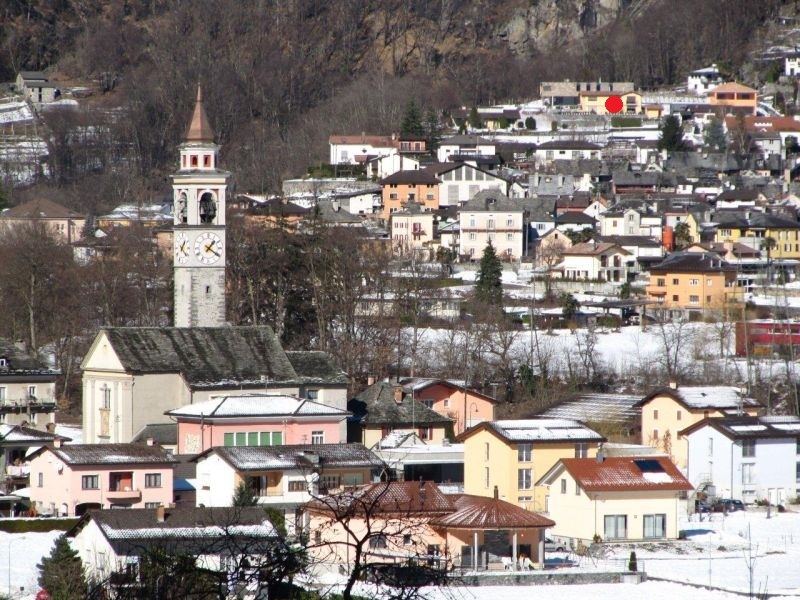 Ideally situated for exploring the Bavona Valley and the beautiful towns of Locarno and Ascona and Bosco Gurin.